The staff members in the Office of University Relations are here to help the Northwestern community publicize and market their events to the public, as well as provide photographic and poster design services as time allows. Printing Services also provides design services. If you have an idea for a story about your department, students, clubs, etc., and need to the get word to the public, please use the Submit News to Us! link to answer a few questions that will help us learn more about your event. If we need more information from you, we'll contact you. We'll issue a press release to various media outlets for you and also provide a copy to our student media groups. Please provide your information to us at least two weeks (if not more) before any event. Press releases should go through our office. Please do not send to the media yourself. We also run the University's website. If you are interested in learning how to edit your department/program pages, please let us know, and we'll set up training sessions to teach you how to do it. If you are interested in creating a social media presence representing Northwestern, please see our Social Media page. Please consider using the official Northwestern social media channels before creating a new channel as we have a significant following on our platforms. Let us know if you have items you'd like to have posted. We have provided other information regarding the use of our logos and publication design, and where you can find a number of the photos we take each year. 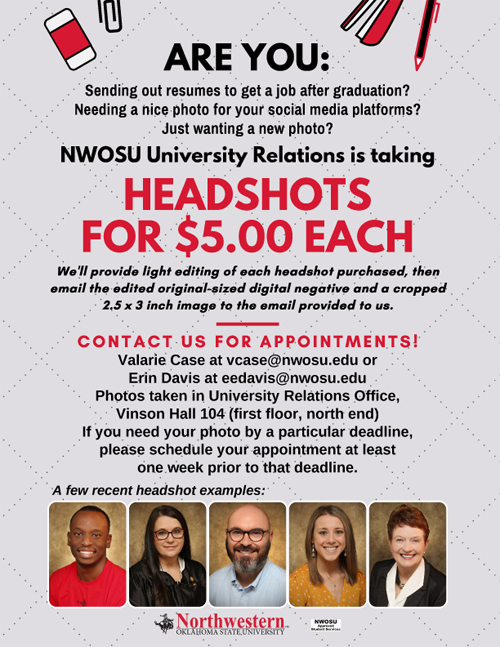 Our office is offering inexpensive headshots for Northwestern students and employees who are looking to show a more professional presence on social media platforms or needing something to go with a resume for a job search. Just contact Valarie or Erin to schedule an appointment at least one week before you may need your photo. Cost is only $5.00 for each image selected. We'll do some light editing and email to you the edited original-sized digital negative and a cropped 2.5 x 3 inch image.